A network location identifies the type of network that a PC is connected to with a network adapter. By default, the first time you connect to a new network (wired or wireless), you will be prompted "Do you want to allow your PC to be discoverable by other PCs and devices on this network?" by the Network Location wizard. Turning on this setting prepares your PC for sharing files and devices on a network. Based on the network location you choose, Windows will automatically assign a network discovery state to the network and automatically sets the appropriate Windows Firewall and security settings for the type of network that you connected to. You can change the network location anytime. 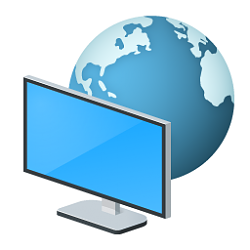 This tutorial will show you how to set the network on your PC to be connected to a domain, public, or private type of location for all users in Windows 10. You must be signed in as an administrator to be able to change the network location of a network adapter. Public network = By default, the public network location type is assigned to any new networks when they are first connected. A public network is considered to be shared with the world, with no protection between the local computer and any other computer. Therefore, the Windows Firewall rules associated with the public profile are the most restrictive. This blocks the following apps and services from working: PlayTo, file sharing, network discovery, and automatic setup of network printers, TVs, and other devices. Private network = A private network location type can be for home or small office networks, or when you know and trust the people and devices on the network. This setting allows your PC to connect to a homegroup and devices on the network, such as printers. Domain network = The domain network location type is detected when the local computer is a member of an Active Directory domain, and the local computer can authenticate to a domain controller for that domain through one of its network connections. EXAMPLE: Network Location of adapter in "Network and Sharing Center"
1. Do step 2 or step 3 below for how you would like to open Network settings. 3. Open Settings, click/tap on the Network & Internet icon, and go to step 4 below. 4. Do step 5 (Ethernet) or step 6 (Wi-Fi) below for you currently connected network. 7. Do step 8 (Private) or step 9 (Public) below for the network location you want. 9. When finished, you can close Settings if you like. 1. Type regedit in the search box (Windows+Q) on Start or taskbar, and press Enter to open Registry Editor. 7. When finished, you can now close Registry Editor if you like. 8. Sometimes you may need to sign out and in of your user account to apply the new network location. 1. Open the Local Security Policy (secpol.msc). You can click/tap on All Networks if you wanted to apply this to all networks on your PC instead of a single network. 4. Do step 5 (Not configured), step 6 (Private), or step 7 (Public) below for what you would like to do. B) Under Location type, select (dot) Not configured. C) Under User permissions, select (dot) Not configured. D) Click/tap on OK, and go to step 8 below. B) Under Location type, select (dot) Private. C) Under User permissions, select (dot) User cannot change location. B) Under Location type, select (dot) Public. 8. You can now close Local Security Policy if you like. Thank you to our member sm156 for pointing out this option. 1. Open an elevated Windows PowerShell. 2. Do step 3 (see current location), step 4 (Private), or step 5 (Public) below for what you would like to do. C) Go to step 4 (Private) or step 5 (Public) below for what you would like to set your network location as. Substitute Brink-Router3 in the command above with your network name from step 3 above instead. 6. When finished, you can now close PowerShell if you like. 2. Do step 3 (Private) or step 4 (Public) below for what you would like to set the network location of your current network connection. 5. When finished, you can now close PowerShell if you like. 1. Do step 2 (Private) or step 3 (Public) below for what you would like to set the network location of your current network connection. 4. Save the .vbs file to your desktop. 5. Run the .vbs file. 7. Click/tap on Yes or OK when prompted by UAC. 8. The network location of your current network connect will now be changed. Hi Brink great job I have one more way of changing the network location so if you ever get the time to add an option 4 here it is, Feel free to delete this post if you do. Find the interface you would like to change, In my case it is Ethernet-2. Note: Originally my interface was called " Ethernet 2 " Powershell would not accept the following commands with a space so I renamed the interface to " Ethernet-2 " . No matter what I do the changes are not persistent after a reboot no matter what method I have tried in your tutorial I think it has something to do with " Network location Awareness " I think I will have to make a automated task in task scheduler to make it persistant. I'm not sure why your setting is not persistent. It's stays set for me after a restart. Do you have network discovery turned on? Thanks one thing about Option 4 in my case anyway was that PowerShell would return an error when my network card name had a space in it, Originally it was called "Ethernet 2" and the only way it would change state was to rename it "Ethernet-2"
Something weird is going on with this Win 10 home edition I didn't notice until today that whenever I turn on Network discovery and press save then close Network sharing center and then reopen it my settings have changed back to turn off network sharing. I did want to try to figure it out but I'm tired of searching and the home edition does not have gpedit or secpol which is aggravating even when I don't have a problem and I do have a key for Windows ten Pro but I have been procrastinating and not installed it yet but I think I will do that this weekend. I have a domain at home with desktops running W10 Enterprise. Clean installs. The Network location on each shows the domain (with the domain name). When the computers were set up, it took a couple of hours, but each machine was able to browse the network and see every other computer regardless of OS (7, 10, 2008r2 or 2012r2). The DC runs 2012r2. Do you have any idea what the update might have changed or defaulted on these desktops? I am not sure how to get started fixing this. Whatever did change, probably was something that didn't work in previous builds or didn't exist, I guess. I also find it odd that they still see the W7 Pro X64 desktops. I wish I could help, but I have no experience with domains for this. Please go ahead and create a new thread in the Network and Sharing forum area to see if someone may be able to help soon. "Find devices and content" in #8 and #9 now reads "Make this PC discoverable" in Win10 TH2. MS just wants to keep you on your toes.